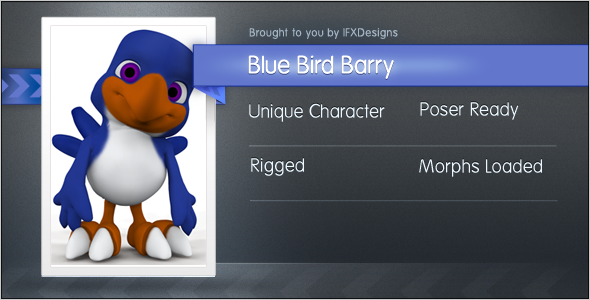 Blue Bird Barry is rigged and ready for any 3D Suite that has the ability to import FBX files! We chose FBX as our main form of distributing this model because of the ease of use. Instead of making it for one program such as Maya or 3D Studio Max this model can now be used in Lightwave, Modo, Blender, and any other program that supports FBX import. This saves us time because we don’t have to rig for each program, and it saves you time as well, because you don’t have to figure out how to use a different 3D package just to use our model. It is a win/win situation all the way around. Comes with 2 basic user guides for 3D Studio Max and Autodesk Maya. These guides are very basic and are aimed at the user who has never imported an FBX character before and has no idea how blend shapes and morphs work or where to find them.